Social media has gone crazy. 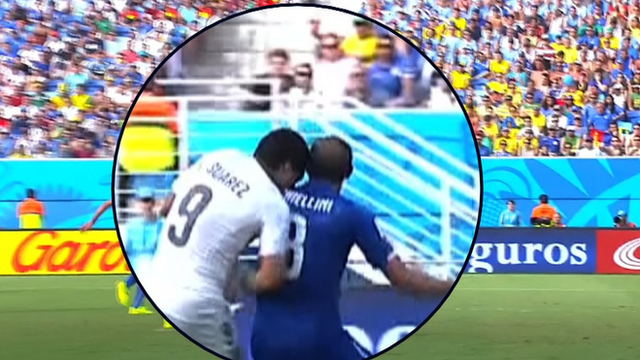 On one view, Suarez bit Chiellini, in the causative sense that his teeth went into Chiellini's shoulder. There is an alternate theory, however, that, given how deep the marks looked on Chiellini's shoulder, Chiellini pushed his shoulder blade into Suarez's teeth. But perhaps it is both. Perhaps Suarez intended to bite Chiellini but at the same time, Chiellini abruptly and forcefully jerked his shoulder in response to Suarez's movement. What is clear is that there is some kind of mark on Chiellini. 4. 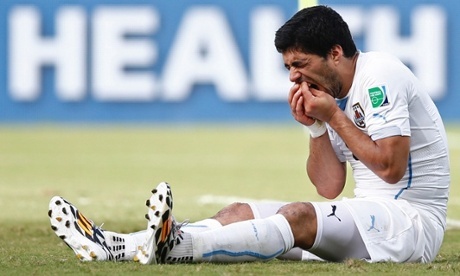 Is it not more probable than not that the bite mark came from Luis Suarez given that he was the only one who placed his mouth in that area? 5. If Suarez did bite him, did he intend to bite him?" Whatever is to come of this, it is quite interesting. Suarez might get an international ban from football, which means he's less likely to be injured for the domestic club season. This may make him more attractive for club managers, provided that the international ban can't be transferred to club football (can it?). However, will any manager want to risk him given that he is, like Ballotelli, that sort of self-destruct or explode-into-many-goals sort of player? He'll either win you the game or get a red card. Some are saying Liverpool will want to sell him because of that. Will anyone buy him when he poses that kind of risk? Possibly, it will be interesting to see what unfolds. The best and most hilarious part of all of this was the fact that when Chiellini pulled his shirt down to show the bite mark to the referee, Gaston Ramírez (I think), bounced along like a little kid next to him and tried to pull Chiellini's shirt back up, as if trying to cover up the evidence and as if to say "Why do you want to show the ref?". I laughed like crazy. 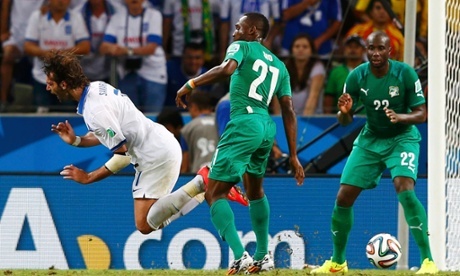 Ivory Coast knocked out; Greece win on a last-minute penalty!!!!!!!!!!! What a finish to Group C!!! I can't believe Greece made it through, though not without controversy. Looking at slow motion replays, it seems as though Greece won themselves a penalty even though, upon a closer view of the replay, Samaras seemed to trip on his own foot. Though it may be argued that the Ivory Coast defender impeded Samaras' swing from behind slightly, the dominant cause of his fall appears to be Samaras tripping himself over. Therein lies the controversy. It's unclear if Samaras made the most of the situation and deliberately fell over. However, Samaras kept his composure and the Greeks are a very dangerous and unsuspecting nation - they make the most of their chances even with less possession and their defending is generally solid (as seen from qualification and the current campaign, with the exception of the match against Colombia). I'm a bit disappointed for Ivory Coast, them having failed to qualify three times in a row now, from 2006 to 2014. Greece have finally made it to the Round of 16 after 3 times in the World Cup. See how Greece had hardly any goals conceded in their qualification campaign? However their main struggle is a lack of goals scored. But when you have a good defence, you don't need to score that many goals. 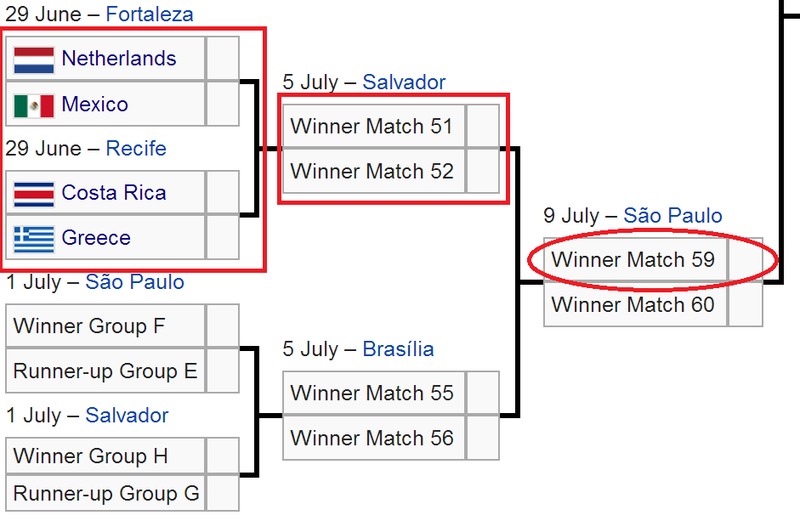 Now, it seems like Nigeria has the best chance of qualifying for the Round of 16, followed by Algeria and then Ghana. Can Algeria draw with Russia? I'll give this a bit more thought in due course and write my predictions tonight. I hope at least two African nations make it through, preferably all three. It seems like there is no hope for Asian teams with the exception of perhaps Iran if they can pull off a 2-0 victory (unlikely) and Nigeria don't obtain a draw or better (this part is likely). Courtesy of Wikipedia, as usual! There is an exciting part of the World Cup draw and it's the bracket that leads to a potential semi-finals with Argentina or Belgium/Strong Runner-Up Group G Candidate. Because all of these countries have never won the World Cup before. I'd really like to see a new country win the World Cup this time. This semi-finals bracket essentially gives one of these countries a comfortable "cushion", allowing them to be shielded from the real giants and contenders at this World Cup. France and Germany potentially meet in the Quarter-Finals. Amongst the contenders for this hipster semi-finals spot, Mexico is the prime example of consistency, making the Round of 16 6 World Cups in a row from 1994 to 2014 (being banned in 1990 and making it to the Quarter Finals in 1986 and 1970). We all know that the Netherlands have made it very far in past World Cups. Meanwhile, Greece and Costa Rica are just happy to be joining the party (though Costa Rica did make the Round of 16 in 1990 and Greece's crowning glory has to be Euro 2004). I don't mind any of these teams making it to the semis, but I'd prefer the Netherlands as I really want them to break their duck, mirroring what Spain did last time around.